However, Cross Counter was flying in the final furlong and while Marmelo also tried to produce a winning sprint, he had no reply to McEvoy’s mount. The Aidan O’Brien-trained Rostropovich finished fifth, but fellow Ballydoyle inmate Cliffs Of Moher sadly broke down passing the post for the first time. 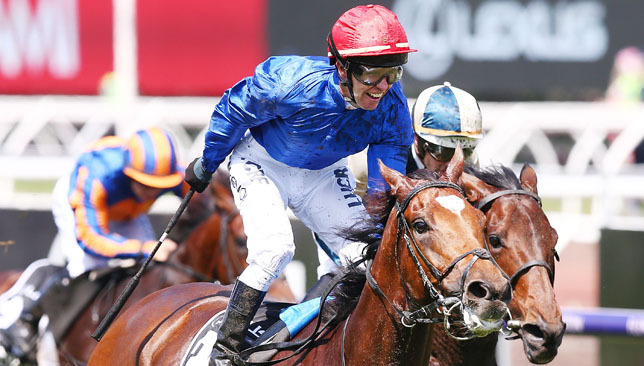 McEvoy said: “What a thrill – to do it for Sheikh Mohammed and Charlie Appleby. Obviously Godolphin has been a huge supporter of mine. Well done to Charlie and this little horse. He said: “It’s a very special day for us all. “For me it’s obviously very special to be here, but for the team, it’s just fantastic. 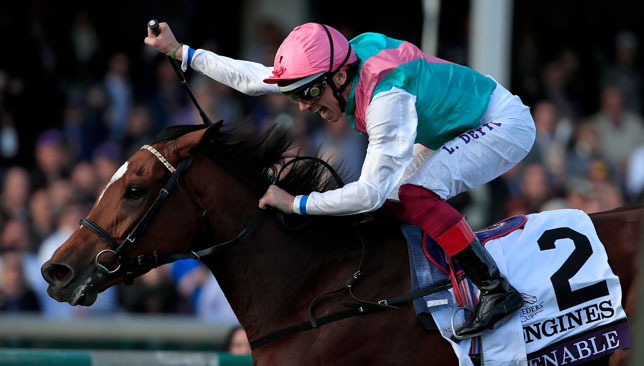 I’ve spoken to His Highness (Sheikh Mohammed) and he’s over the moon about this result – it’s a challenge that’s been a long road. Accelerate made trainer John Sadler’s first Breeders’ Cup victory a big one, winning the $6 million Classic at Churchill Downs on Saturday. Sadler was 0-44 in Breeders’ Cup starts coming into the 1 1/4-mile showpiece of the $30 million festival, including a close call in the Mile earlier in the day at Louisville, Kentucky. “Feels really good,” said Sadler, who admitted the constant questions about his Breeders’ Cup record had become “a point of irritation”. Now, all that can be forgotten. Ridden by Joel Rosario, Accelerate showed some reluctance to enter the starting gate, but he broke cleanly and settled in as the Aidan O’Brien-trained Mendelssohn took the lead under Ryan Moore and blazed through a sizzling first quarter-mile. Mendelssohn was still in front when they turned for home, but he couldn’t hold off the challenge of 5-2 favorite Accelerate, who won by a length from 28-1 shot Gunnevera. Godolphin’s Thunder Snow, the Dubai World Cup winner, challenged late but finished third, 1 3/4 lengths back. 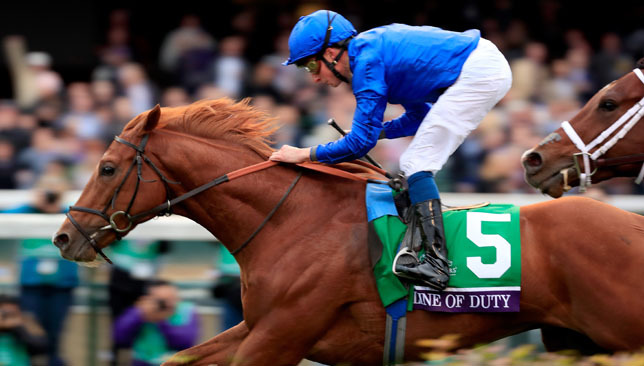 Line Of Duty added further lustre to a year to remember for Godolphin trainer Charlie Appleby with victory in what proved to be a dramatic running of the $1million Breeders’ Cup Juvenile Turf at Churchill Downs. William Buick’s mount looked beaten at one stage, but picked up bravely to get the better of Uncle Benny – although the pair did bump just before the line, as well as coming close on the turn. A tense wait ensued, but the placings remained unaltered. Derby-winning trainer Appleby was recording his third career win at the meeting from just five runners. He said of his Galileo colt: “He was under the pump pretty early in proceedings, but it didn’t really bother me as he just loves to be driven, and the harder you drive him, the more he finds. It was a fantastic ride by William. “I knew when he got him rolling down the straight there that he always hits the line strong, I knew he’d find plenty and that’s what he did. Buick said: “He didn’t come out as well (from the stalls) as I’d have hoped, and when the incident happened my horse had come out to the middle of the track, while the other horse came across a gave me a couple of bombs. “Then my horse lost his concentration, but it was right on the wire. Although it made no difference to the result, I would have respected the decision if it had gone the other way. Arthur Kitt was a gallant fourth for Tom Dascombe and Richard Kingscote, but Aidan O’Brien’s Anthony Van Dyck found things against him, breaking well enough from his draw in stall 14 but never able to get cover and ultimately struggling.